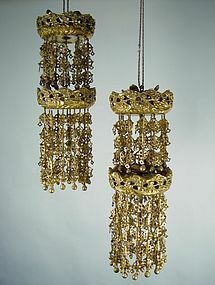 A set of old hanging ornaments for Buddhist temples or private settings. Decorated with gold leaves (genuine) over the lacquered wood and paper (small ornaments). The color of gold is soft, one or two strings are missing. The last photo shown here is Azabu Dai-Kannon in Chokoku-ji, Tokyo. Approx. length 15 inches long, Meiji period (1868-1912).